Nas Export - Exporter of amaranth seeds, hps groundnut kernels peanuts & cumin seeds in Kannur, Kerala. We can offer you superior quality of Amaranth Seeds with 99.9% purity. Amaranth has broad leaves and large flower heads that produce thousands of protein-rich seeds. Amaranth seeds are tiny yellowish and round. 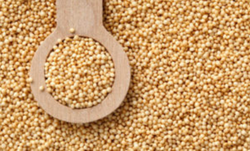 Amaranth contains three times more fiber than wheat and five times more iron than wheat. Its unique nutritional properties make it a grain with many applications in the food industry. It can be used in preparation of multi grain cereals, health foods and high-energy granola bars. Amaranth can be puffed (like tiny popped corn) or ground into whole grain flour. protein per 100 g serving, a higher proportion than in many tree nuts. Our vast experience and expertise in the business of Groundnuts has made it possible for us to process & deliver quality Groundnuts. Groundnut (Peanuts) is the mainly oilseed of India, commonly known as Mungphali. Peanut Production is approximately 25% of the total oilseed happens in India. The groundnuts seeds are particularly valued for its protein contents, which is of high biological value. The main use of groundnut is as a source of edible oil, but the high oil and protein contents also make it an important food crop. We also make available whole cumin seeds, which are further processed and then used as per the requirement. We procure them from the highly reliable vendors of Gujarat as the state is famous large as well as finest quality of cumin seeds. They are also used as raw malarial for several herbal and Ayurveda medicines. Today, cumin is the second most admired spice in the world after black pepper, usually get used in foods, beverages, liquors, medicines, toiletries and perfumery. Cumin can be used to season many dishes, either ground or as whole seeds. Cumin is said to help in treatment of the common cold, when added to hot milk and consumed. Cumin seeds are a very good source of iron and a good source of manganese. Other nutritional are Protein, Carbohydrate, Dietary fiber, Vitamin A, B, C, E and K, Calcium, Phosphorus and Potassium. Acid insuluble ASH 1.75 % Max. Total ASH 9.50 % Max. Volaile oil Min. 2.00 ml /100 gms. ntel, the Intel Logo, Intel Inside, Intel Core, and Core Inside are trademarks of Intel Corporation in the U.S. and/or other countries. USB Type -C™ and USB-C™ are trademarks of USB Implementers Forum. Based on competitors as of September 2017 of convertible, non-detachables having a Windows Pro OS and 6th or 7th generation U series Intel® Core™ vPro™ processors. Up to 18-hours of battery life with an optional U Series processor. Windows 10 MM14 battery life will vary depending on various factors including product model, configuration, loaded applications, features, use, wireless functionality, and power management settings. The maximum capacity of the battery will naturally decrease with time and usage. See www.bapco.com External link icon for additional details. 700-nit display is optional, requires HP Sure View and must be configured at purchase. Touch enabled display will reduce actual brightness. Based on HP's unique and comprehensive security capabilities at no additional cost and HP Manageability Integration Kit's management of every aspect of a PC including hardware, BIOS and software management using Microsoft System Center Configuration Manager among vendors with >1M unit annual sales as of September 2017, on HP Elite PCs with 7th Gen Intel® Processors. HP Multi Factor Authenticate requires 7th Generation Intel® Core™ processor, Intel® integrated graphics, and Intel® WLAN. HP Sure Start Gen3, available on HP EliteBook products equipped with Intel® 7th generation processors. HP Manageability Integration Kit is available as a download from http://www8.hp.com/us/en/ads/clientmanagement/overview.html. Sold separately or as an optional feature. Inking requires Windows 10. Not all features are available in all editions or versions of Windows. Systems may require upgraded and/or separately purchased hardware, drivers and/or software to take full advantage of Windows functionality. Windows 10 is automatically updated, which is always enabled. ISP fees may apply and additional requirements may apply over time for updates. See http://www.windows.com External link icon. MIL-STD-810G testing has been completed and is not intended to demonstrate fitness of U.S. Department of Defense (DoD) contract requirements or for military use. Test results are not a guarantee of future performance under these test conditions. Accidental damage requires an optional HP Accidental Damage Protection Care Pack. HP PhoneWise client is only available on the HP EliteOne 1000 All-in-One G1, HP EliteBook x360 1020 G2, HP EliteBook 1040 G4 platforms. For HP PhoneWise system requirements see www.hp.com/go/HPphonewise. HP PhoneWise not compatible with HP WorkWise at launch. Choose from Intel or AMD graphics options. The Pavilion All–in–One comes with the latest 7th generation Intel® Core™ processor for a level of performance you'll notice every time you browse the web, stream your latest shows, or flex your creativity. Applications open faster, programs run smoother, and multitasking is a dream, with up to 16GB of RAM that help handle your more demanding requests.